The perfect addition to this great great line of products! Our Eclectus go crazy over pomegranates so the season is never long enough to suit them but the mess is sometimes a bit frustrating for those of us washing the beak wipes off the walls, cage, playstands, bowls, etc. 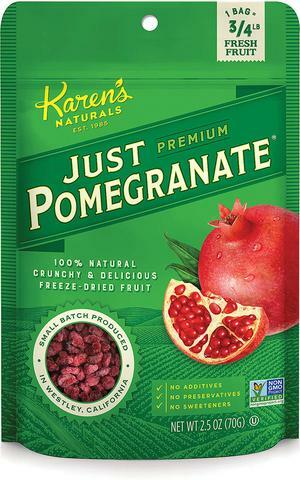 Packing a powerhouse of health benefits, great flavor and brilliant color; freeze-dried Just Pomegranate arils (seeds) now are available year round. Pomegranates are high in Vitamin C, calcium and potassium and are a great source of fiber and antioxidants. Enjoy them as a snack right from the tub and be sure to share with your feathered family.